I am an independent fully qualified DSA instructor (Grade A). That means a green badge holder. I teach in a Ford Fiesta with manual gears. 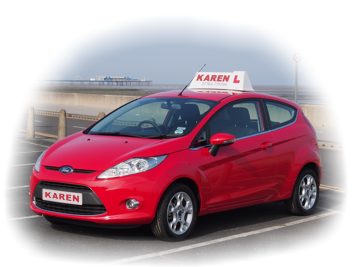 I have been teaching in the area for over 10 years now so know exactly what the examiners expect from my learners. I try to keep my hours of teaching to a maximum of 25 per week as I feel this really benefits my pupils and ensures I can give them all the attention they deserve. I have a fresh way of thinking and believe I make every lesson memorable with some of the daft ways I have of making my pupils remember certain situations. I am probably the most relaxed person you will ever meet, I have been very rarely shocked by anything my pupils do. Head butting the window when checking the blindspot has to be one of my favorites! Mistakes happen, no point stressing about them. I pride myself on the way I handle my nervous pupils, nothing better than seeing someone's confidence grow - very satisfying. All I want is to teach my pupils to drive defensively and keep themselves safe on today's hectic roads. Safe driving for life not just for the test. I also appreciate it is a very expensive process and do my very best to get you remembering points from every lesson to help ensure the whole process is cost effective. Give me a call, have a chat, interview me. Remember it's your choice, make it a good one.